I did think about pulling out a project or 2 that are closer to completion, but I wanted to stay focused on what I’m actually working on. Sew, I’m actually OK with my numbers! Really, I am! I was finally able to sit down and do a bit of quilting … I’ve only got a small portion of this queen sized quilt done … but I’m liking it so far! This past week has been busy with company and working. Sew, there has been very little sewing going on. I did manage to get one quilt sandwiched … a small one one the left! This quilt was started at a retreat at Over the Rainbow Lodge on Camino Island last year. My design wall now has a secret project on it. I can show you the material for the back. And no, the picture does not give the true colour! I told you, it’s a secret project – so you won’t be able to see it until May. It is a UFO that is for a secret exchange … I can tell you that it will be a table runner and the theme is winter. Orca Bay has all the borders on it! One of the blogs I follow (Home Sewn By Us) had a post about Bargello quilts. She has links to a few free patterns. And a picture of a pretty awesome one in blues. You can see that post HERE. The table runner pattern is CUTE … but I’m resisting … or at least trying to. I have made a few bargello quilts using Bonnie Hunter’s Scrappy Bargello free pattern. The first one I made using Bonnie’s pattern has a controlled colour pallet of fall colours. It was a lot of fun to make! And, I must admit, it looks pretty nice on a bed in a log home! Yes, this could definitely be me. Since I’m not a perfect quilter … never have been, never will be … this could have been me with my quilting friends! When I was first learning to quilt – before we had rotary cutters, we tore our fabric into strips to make Log Cabin – Quilt in a Day – as per Eleanor Burns instructions back in the day. And you know what happens to torn strips! They stretch and are not nice and straight on the edges … so you learn to fudge. I still fudge! One of the pieced borders is on. I had my husband and daughter vote on which red to use in the border. Do you know which one was chosen? Which would you choose? They both went with the bottom red. I’ve got it cut out. SEW – 3 more pieced borders to sew on … 4 red borders … and 4 black borders and it will be a flimsy. SEW – a total of 11 more seams! FINALLY: light at the end of the tunnel! And a finished flimsy will be born! Yes, a labour of love … in this case, a long labour! I have organized my Bonnie Hunter Pinterest board by quilt names. Whew … I KNOW Bonnie has made a LOT of quilts – but when I started organizing them by name, I was, again, blown away. You can visit my Pinterest board HERE. 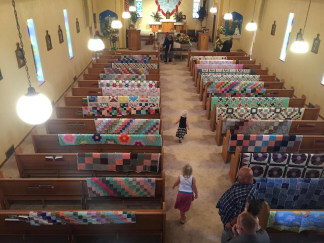 Yes: Saturday was International Quilting Day. This weekend The Quilt Show has 23 free shows to watch and prizes to win (if you live in the USA). Click HERE for details and take advantage of the free shows. Yes: Orca Bay – the centre is done. Just need to add borders. No finishes towards my PHD because there was nothing finished this week! So the numbers stay the same. No shopping – nothing added. Yes, I was at Tradex at the Creative Festival and I only bought 2 sided fusible pellon. No fabric. To be honest – I didn’t take a good look at the fabric and so I didn’t buy any. I did see a quilt panel that was fractured at the Quilted Bear booth and the same panel that was not fractured at the Needle & I booth. They were both wonderful! Beautiful colours and great quilting. But I was only tempted to admire, not buy! Yesterday & today, I was helping a friend with her booth “The Steamtrunk.” It’s work, but it’s fun. I get to visit with my friend while we set up, and then, when the customers come, I get to see a lot of people that I haven’t seen for awhile. Yes, it’s fun! I didn’t have time to take a picture of the booth today – these pictures are from a year ago. I don’t want all 17 of those blocks in the final section to be almost identical. I don’t want to take out any of the webbing. I’m running out of black and I’m not going to buy fabric – no way!!! So my conclusion is: finish the quilt just like the pattern says. Make it bigger by adding borders … Yes, I do have 4 black and 4 white Ohio stars left and some of the blue string blocks … but I can do a few things with them. I can make a table runner, make a tote bag, make a few zipper bags or put them on the “free” table at the guild. Of course, at this point in time, I don’t really have a plan … but if I do something with them – you’ll find out in a future blog post. A friend sent this link to me – suggesting it might be a great topic for my blog. A family decided to drape all the pews in the church with quilts the quilter had made. From this picture, you can see that she made a LOT of quilts – with a good variety of colours. How cool is this? All the blocks for Orca Bay are made. Yes, all of them! Oops, not quite! I mean, all of them for the main part of the quilt. The border blocks are in progress as leaders and enders and should be completed by the time the main part is webbed together. Yes! Light at the end of the tunnel! For the past 2 months, the guild Quilting 101 class has worked on baby quilts. We choose a simple pattern and made 7 quilts. It was good learning … how to make large half-square triangles, How to trim them easily and then arranging the blocks. This month we did quilting with the walking foot. Organic waves. I thought it was fun to quilt! Unfortunately, I only have pictures of the one I did. Next month, the group will be putting binding on and I will try to get more pictures of the quilts then. Silly me, I went ahead and put the binding on this one – so I’ll need to find another project to demonstrate binding next month. That shouldn’t be too hard! . This quilt finishes about 37 x 37″. The 2nd picture is from the back with the sun shining through … fun. The white Ohio stars are done. About ¾ of the black ones are done. And about ½ of the red string triangles with black and white “wings” are done. I need to make a zillion more “wings”, but they are not as tedious as the hourglass blocks to make. (In my opinion). Then there is the assembly of the quilt, then adding borders, then quilting, making and adding the label and then binding. Believe it or not … I think I see a glimmer of light at the end of the tunnel. It’s just a glimmer. All of the straight line “in the ditch” quilting has been done. I think I have decided what to do in the big negative rectangle spaces: a feather arch. The big floral-type squares will likely be a flower made with what I call “C”. And the checkerboard section … who knows. No finishes towards my PHD because there were no UFOs finished this week. So the numbers stay the same. I used guild fabric for the above pink quilt – so nothing deleted from my stash. No shopping, so nothing added! to all of you who posted comments about my gifted “Thank you Notes” quilt! I was already overwhelmed with the love that the quilt represented! And then the many comments from my blog readers … wow!!! You can read about it HERE. How can you say “that’s different?” Is it different? So is that really how they felt? Maybe … sometimes it’s just hard to accept gifts … but this gift I accept with love in my heart! Two posts from February 2017 show the progress I had made on Orca Bay at the time. You can check them out HERE and HERE. The first picture is of the blue string blocks. The middle and right picture are the red string triangles that I cut from my red string fabric. I made the red string fabric from strips of my red fabric. Today, I have all of the hourglass blocks made, although I still have to trim a few. But – that monotonous task is done!!!! And, some of the white Ohio stars are in progress. For some reason, when I was figuring out how many red triangles I needed, I was way short. There’s a huge difference when you need to make 1/3 as many more. SEW … I still have a zillion pieces to go … but seeing those partial Ohio stars helps me think that this may get done! What do you say when your husband says, “A parcel came for you.” And he pulls out a big box … and … it’s from a cousin in Ontario, Terry, … she quilts … and the tape on the box says, “Connecting Threads.” And I’m thinking that she sent me something from them … but what? I have everything I need for quilting … and she knows that I do not need more fabric or ANYTHING! Then I open the box … there’s a gift bag inside … it looks like it might be a quilt. I said to my husband that I had teased Terry in blog-land about making a quilt for her western cousin – but I certainly wasn’t serious. The fabric line is “Irresistible Iris.” Iris was my mothers name … and of course she did LOVE irises! What a perfect fabric selection! There are “Thank you” notes from everyone in my Ontario family that I made quilts for using my Grandma’s Fabrics – all 14 of them. You can see the story of those quilts HERE. Plus, there are a few notes from my aunts and uncle that have also received quilts. The note above is from my thoughtful cousin that put it all together. Sew beautiful!!! Yes, there were tears … I couldn’t believe it! I still can’t! The pattern she used is “Envelopes” and is perfect for a signature quilt. Each of the “notes” is tucked inside an envelope. Isn’t it pretty awesome? I’m reeling from the LOVE and thoughtfulness that went into this quilt. It was totally unexpected! Reeling is an understatement … I’m totally overwhelmed! I don’t know if it’s the weather or not, but it just seems like my quilting is progressing very slowly! Quilting: I’m still quilting in the ditch to section off parts of this quilt … I like the quilt, but every single time I decide to stitch in the ditch, I remind myself that it would be much much faster to free motion. Piecing: I’m slugging away at Orca Bay … the only step I’ve completed is the blue string blocks which will be part of the sashing – and they were completed sometime last year, along with the red string triangles. All of the other units are in progress. It seems like it’s taking forever … and I’m not enjoying the hourglass blocks … lots and lots of them to do. I have no idea how many more I need to make … who counts when you have a billion to make? The first picture is the pile of blue string blocks. The 2nd picture is some of hourglass blocks – waiting to be sewn. The last picture is some of the hourglass blocks joined to the red centres of what will eventually become Ohio Star blocks. I was wandering around blog-land when I came across “The Free-motion Challenge Quilting Along” by Angela Walters of Quilting is My Therapy. The first video talks about what you need for the Challenge … the necessities and the “nice-to-have.” There is even a free quilt pattern to do the quilting on. Am I going to make the free quilt? Yes & No. I’m going to take fabric – draw some boxes on it (roughly the same size as the boxes on her free quilt pattern). Sandwich the quilt and start practicing. I’ve already watched the first video … now I’m ready for Week 2. And the best part: all the videos will be on YOUTUBE … so if you’re like me and already a week or 2 behind, you can still follow along. And it’s FREE!!! And the very next BEST part is: this is learning … it’s like going to a free motion class with a bunch of 12″ squares sandwiched together … and they don’t count as UFOs or anything … so this won’t count towards my UFO list or influence my PHD in 2018. And the very next BEST BEST part: I will learn a LOT about free motion quilting! YES!!! Hole in the Barn Door Wall Hanging used 2 yards. And, I needed backing for a quilt, so I bought 4 yards. Peaceful Sunday @ Janda Bend Quilts (Click on the blue frog to see other links). My finish today is a little quilt (17″ x 22″) that I started when we were in Quebec. The first picture is a me & the setup at the campground outside Montreal. The 2nd picture is the little one a few days ago … I had tried quilting it on my featherweight … that had worked out OK, except that I didn’t have the right colour of thread – so I took most of the quilting out. Here is a picture of the finished project, hanging on the clothesline under the overhang – since it is raining today! Yes, I’m still working on piecing Orca Bay #2. When I was looking for the pictures of sewing in Quebec, I found this picture of Orca Bay #1. Lynette @ What a Hoot! I have completed 12 UFOs. My goal for my PHD in 2018 is to complete 28. I have 16 left. This is a good start towards the goal! Here is the list of the quilters participating in PHD in 2018. Check out what they are up to. Roseanne, from “Home Sewn by US” has the list of 12 quilts that she wants to complete for her PHD in 2018. She has completed 3 of the 12. She was aiming for 1 a month, so is ahead of schedule. Check out their progress HERE. Even though Kate, from “Life in Pieces” states she hasn’t finished anything – she is making progress on a lot of her UFOs. Go check out her progress HERE. Elizabeth has her first quilt for 2018 finished! It’s a quilt-as you go … and looks great! And the label is done as well!!! Check it out HERE. She also has her “TO Do” lists on this POST. On the last post she talks about how she wants “to do it all”, but realizes that she needs to be more realistic. My cousin, Terry, hasn’t been working on her PHD list. However, she has done some fabulous quilting on a baby quilt! I find it hard to believe that she has only been quilting for a very short time. (Less than 2 years!) But, since she’s my cousin, I do believe her. Check out her great quilting HERE. “The Darling Dogwood” author, Emily has posted a picture of her latest quilt. A dog quilt for her neighbours. Check out this wonderful, sweet quilt HERE. I’m not sure how Deena from Dreamworthy Quilts is doing on her PHD list! However, she has the cutest post of LEGS that are done. She’s working on a Christmas quilt that is promising to be CUTE. Check out her LEGS HERE.